African country Morocco, often called the “Gateway to Africa” is a fantastic place many people fall in love with. It’s not that hard at all to fall in love with the country that has so many influences in culture, cuisine and tradition. Morocco has been influenced by an African, European and Arabic culture which makes this country fascinating destination that will definitely broaden your perspective. Morocco offers so many adventures, cultural experiences and breathtaking nature sceneries all over the country which will make your departure pretty hard. 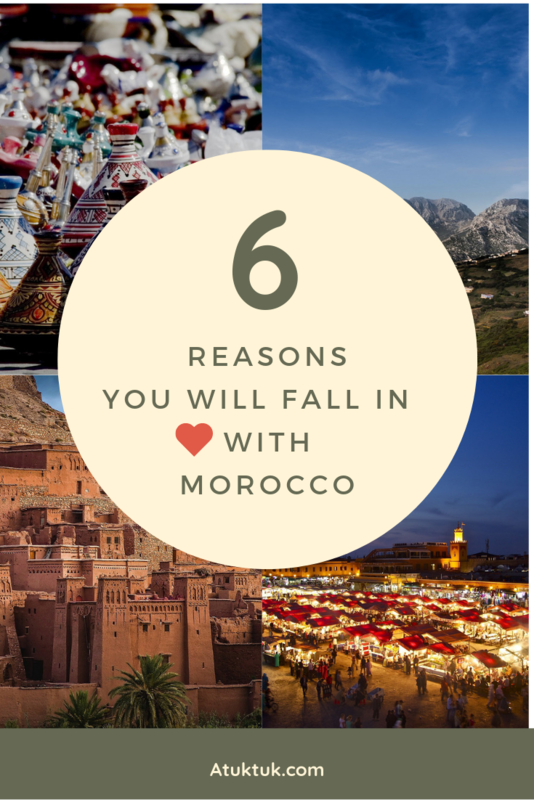 We truly fell in love with the country and we would like to share the reasons you will fall in love with Morocco and why you’ll want to come back. Each major city in Morocco is conceptualised to have few medinas in the city core. Medina is a cultural center where you will experience the local life to the fullest. These places are filled with food markets, local restaurants, shops and many places where locals just gather and enjoy their time. That vibe was something unforgettable and that will be a love on a first sight. Also, these places are created as labyrinths with so many narrow streets that it’s literally too easy to get lost. Medinas are amazing places where you could literally lose yourself and dip in the culture. If you’re a person who is chasing different experiences, then you know getting lost in the city will give you amazing experiences every time. In medinas, you will definitely find your way back, but the things you will experience during your wander through the streets will be something you’ll remember for a whole life. Just follow the crowds and you’ll be fine, but always be aware of your belongings as these places are targets for thieves. Morocco has an impressive architecture due to many cultural influences from few continents. That gave the country one of the most iconic cities regarding architecture. If you love to explore cities and wondering about architecture, then Morocco is an ideal destination for your next trip. Many major cities like Marrakech, Rabat and Fez have walls around the city with the palace, tombs and shrines all over. Morocco is popular destination because of amazing architecture it has. It’s really breathtaking experience to see these cities from a distance, while exploration of cities is a totally different story which will leave you without a breath. Marrakech is the city where you’ll meet so many diverse cultures and experience so crazy things. You can find anything you want in the city regarding cuisine and activities. It has one of the most amazing medians in Morocco which is a perfect way for you to explore their architecture and dip in the culture and their old tradition. The city is very different than other major Moroccan cities as it applies different cultures in every aspect and some in parts, you won’t feel like you’re in Morocco anymore. If you have a chance to explore Marrakech, then consider visiting their most famous square called Jemaa el-Fnaa. Marrakech is one of the most iconic and interesting cities in Morocco. This square is literally a combination of everything as you’ll see food shop, outdoor night eating places, musicians all over playing live music and entertainers with snakes. Also, the place is overcrowded, but it’s not negative things as you will have a stunning experience just to be there, observing people and feeling the energy of the city. Marrakech is a spectacular and unique place where you’ll always want to come back again. Morocco is the country that is covered by mountains and desert. What could be a better way to have an amazing experience than taking a hike to explore near mountains and villages. The great thing is to take a walk and escape the city that could easily overwhelm you. The most attractive trails are located in the Atlas Mountains that are surrounding the most of the country. The interesting thing is that there are different trails so no matter of your fitness levels, you will be able to enjoy a stunning landscape. If you’re trying to reach the peak of the mountains, you will pass along many villages along the way. Escape from busy cities and explore surrounding nature. You can stay there for a night, having their traditional and tasty food while experiencing a local lifestyle. If you’re a passionate photographer, then you will probably want to spend much time in the Atlas Mountains as these mountains provide with fascinating views of nature and nature life. For travelers who are looking to have an adventure of their lifetime, Morocco offers so many different activities. One of the most amazing activity is exploring the Sahara desert on camels. Each trip usually starts in some city leading you to the camp in the desert. The whole trip usually lasts for a few hours until you reach the Bedouin camps, but to warn you, riding the camel for a few hours isn’t the most comfortable experience. Put that aside for a bit and wait until you reach the camp as it’s the time when the real experience starts. Ride a camel through the desert and experience camping with Bedouin nomads. Bedouins usually raise tents around the campfire, prepare their traditional food and people are sharing their life stories in that setting. Also, Sahara isn’t polluted and there are no many people in the desert which means you will only experience silence and million stars above you. It’s one of the most remarkable experiences in Morocco and you will fall in love with it without any doubt. When you take a trip from any major city to Sahara, you’ll almost pass by fortified houses every time. If you take a trip from Marrakech to Sahara, on your way there you’ll confront Ait Benhaddou, a popular and iconic fortress town. The town is surround with great walls and buildings inside are called kasbahs. Check out some of the most amazing fortress towns. This place looks absolutely stunning and it attracted many movies and TV shows to capture scenes there. For example, the movie Gladiator has some scenes from this place as well as Game of Thrones. You can explore this place and also stay there for a night as some of these fortified houses are transformed as a night hostels. What’s the most amazing experience you had during your trip to Morocco and would you like to visit again? Aw, you now made me want to go back to Morocco! Such an amazing country, isn’t it? Djema el-Fna square in Marrakech is one of those places I could visit again and again.